Several years back, I purchased a set of abridged children’s classics from Costco. It was a set of 20 with titles such as Little Women, Treasure Island, Anne of Green Gables and Peter Pan. They are rewritten and abridged, but keep the main story, with some deletions. I started reading them with my oldest when she was 5 to spark her interest in the classics. After my first Face to Face with Greatness seminar with Dr. Shanon Brooks, I remember calling a friend to ask if she thought the abridged classics for children were quality enough. She said she didn’t see any problem with getting kids interested in the classics, and I didn’t see any problem myself. After all, the main story remained the same. My oldest is now nine and a voracious reader. At last count, she’s read more than 80 books in 8 months (that we’ve remembered to log) and most of them rather meaty. Some of her favorites are the Harry Potter Series, the CS Lewis Narnia Series, The Little House on the Prairie Series, the American Girl Books, The Happy Hollister Series….and the list goes on. I’m so proud of how much she loves to read! But I shot myself in the foot with the abridged classics. She’s read most of them and feels as if “I’ve already read it” with those books, even though they are much more hollow than the full versions. Inspiring her to read the unabridged versions has been tricky and not very successful. I did manage to buy a “spin off” of Little Women called Birthday Wishes that has now inspired my daughter to read the unabridged version of Little Women. I thought it would be a book she could relate to as she has four sisters and might understand the dynamics of the characters. My advice: skip the abridged versions. If you don’t find the family will sit long enough for the full versions, just wait a little longer and try again. Eventually together, or on their own, they will read it! Especially if it’s a new story, not the same story with more detail. And I must add, be careful of the classics you purchase. There is a new push to abridge the classics (removing certain language or violence), and it’s not obvious! Orion books and Penguin Classics are an example. In the bookstore a week ago, I noticed the only notation of the change in a Robinson Crusoe book was a small blurb on one of the first few pages saying it was abridged, so please be aware! P.S. The best way to inspire a child to read a classic is to read it yourself, tell little bits of the story that are exciting, and watch the curiosity in their eyes! Update: I wrote this article about a year ago for a different blog, and I wanted to include an update. Since this article, my now-ten-year-old is still a voracious reader and has, much to my delight, read many of the unabridged books she was introduced to as abridged stories. It took effort convincing her she was missing a great deal of the story, and I still stick by my conclusion that abridged books can, in the long run, sabotage a child’s desire to read the unabridged version. Update 2 (12/2018): My oldest child is now 16 and still a voracious reader. She is working her way through a classics list, as are my 14 and 13 year old. 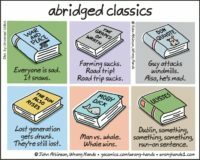 I have never introduced the abridged books to my younger children; I still don't believe they are necessarily counterproductive, but unnecessary to engage children in the classics. Instead, we listen to them as a family, or I listen/read with my smaller children. I have witnessed smaller children understand the story, learning a more complex language structure and vocabulary (versus the books that are geared more toward the age group currently).